If you’re looking for a delicious Valentine’s dessert or a unique dessert idea that’s perfect for Unicorn themed birthday party fun, look no further than these Unicorn Treats! You won’t be able to stop at just one! Even though Unicorns are mythical creatures, that doesn’t make them any less awesome. Unicorn anything is all the rage this year, and it’s obvious why! Unicorns are magical, colorful and just emit a feeling of happiness. Isn’t that why so many people say that they’d be a unicorn if they could? When it comes to creating a fun recipe that everyone is certain to love, this Unicorn dessert just can’t be beaten. The name, Unicorn Bites or Unicorn Treats, is so fitting because each and every treat is literally the perfect bite-size! Related: Magical Unicorn Inspired Crafts, Snacks & DIY! The great part about making up this treat is that it’s really quite versatile. Perfect for Valentine’s Day, but don’t you dare forget about those unicorn-themed birthday parties! Imagine the eyes that’ll light up once they see these delicious treats?! 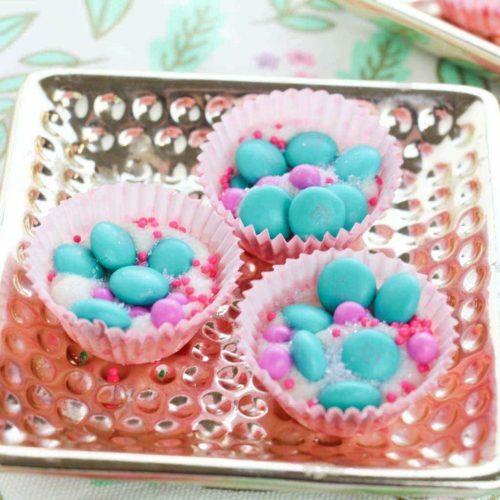 You will definitely be the hostess with most when you whip up a batch of these Unicorn Treats. How long does this unicorn treats take to cook? Here’s the best part of this entire recipe…You literally don’t even have to turn on your oven. You can if you really want to, but this entire recipe can be created using your microwave. How amazing is that? In my cooking mind, that’s a huge bonus because that saves a ton of time. Preheating the oven? Nobody’s got time for that. Count ’em friends…that’s just 4 ingredients to make this delicious Unicorn bite-size dessert. Can it get any more simple? No oven and no giant list of ingredients? This is one unicorn recipe that you’ll want to make over and over again. What happens if these Unicorn Party Treats don’t harden up properly after making? You may need to leave them setting out longer than an hour to let them harden properly. Don’t put them in the fridge, though as this may cause them to “sweat” and nobody (and I mean nobody) wants to eat sweaty Unicorn Bites. One of the most fun aspects of making these Unicorn Bites is the decorating! The bright colors are just awesome! 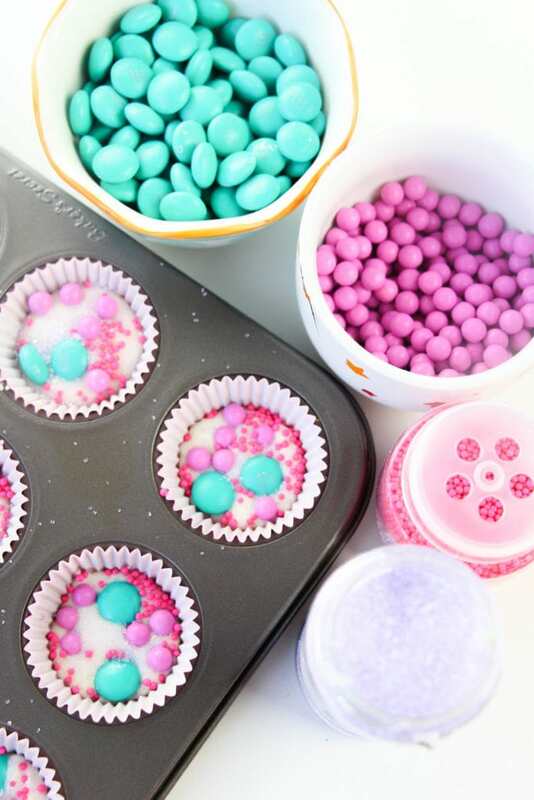 Let everyone pitch in on the fun and add those M & M’s and sprinkles. 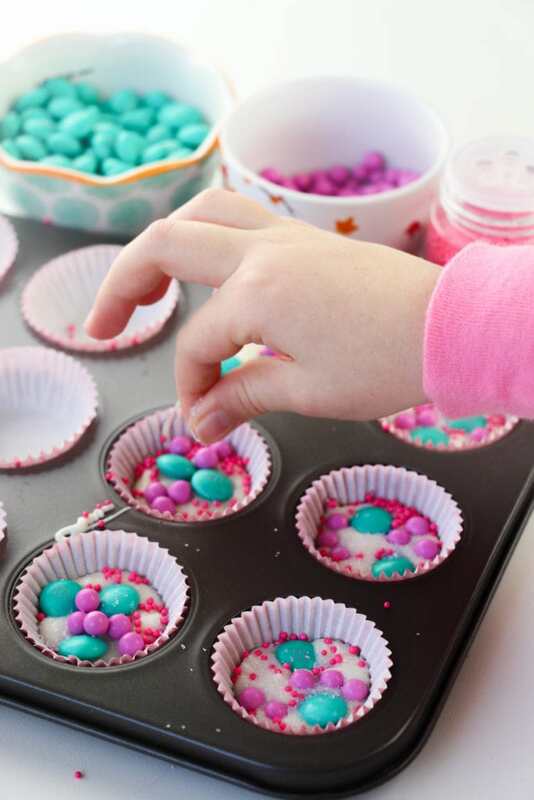 The toppings are key to making these Unicorn treats stand out, so let the kiddos have a blast making each and every one unique. 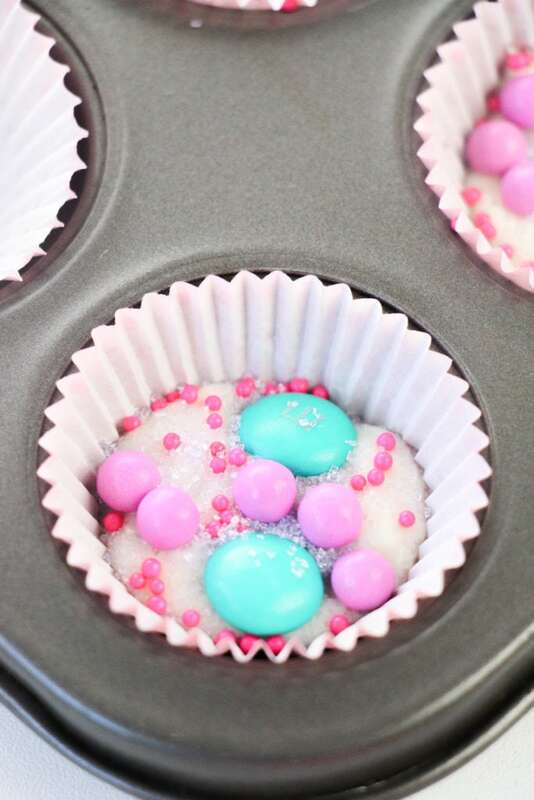 Looking for an easy dessert idea that's perfect for Unicorn themed parties? 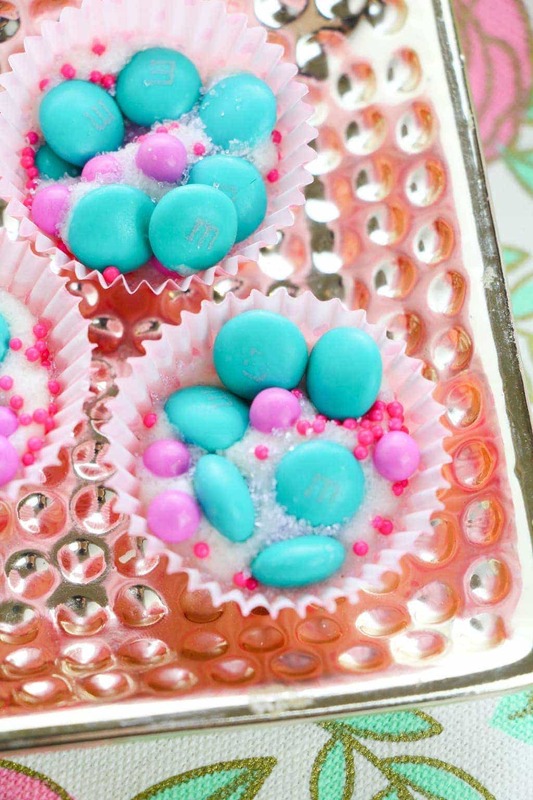 Look no further than these Unicorn Party Treats! For the microwave, heat in 25-second increments, stir well, then reheat as necessary.